"Every quilter will warn you that it’s VERY addictive, can take over all your spare time and is costly because you always HAVE to add more fabric to your stash. Yes, you'll even have to learn a whole new language. Plus all quilters know and abide by the saying 'She who dies with the most fabric wins.' It doesn’t have to be that way, of course. 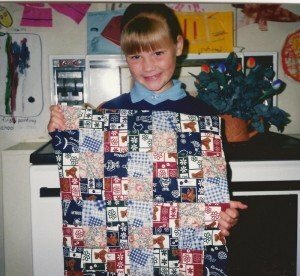 Would you like to make a patchwork quilt but have no idea where to start? My best advice is start with something small and easy to see if you like patchwork and if you do, continue on and you will learn more techniques and acquire greater skills along the way."